It was AMAZING! We have totally made them scary again. I expect everyone to be watching from behind their sofas, I know I will... Karen is talking excitedly about the return of the Doctor’s most fearsome and famous enemy the Daleks. The opener to series 7, Asylum Of The Daleks, will feature the most Daleks ever to be seen on screen and from the different decades, including a special appearance form Russell T Davies’ Dalek, I am so pleased that he now owns an official Dalek, it was a real honour to act opposite him and I think he is going to go far! she says rather cheekily. We actually kick-off the series with Amy and Rory’s relationship in a sticky situation; it is less than marital bliss. Those scenes were really interesting to do, she explains, because they created such a different on-screen atmosphere between Amy and Rory, something that the viewers wouldn’t have seen before. That is the good thing about Doctor Who, it gives you the chance to shift the character, and you never know what is going to happen from episode to episode. 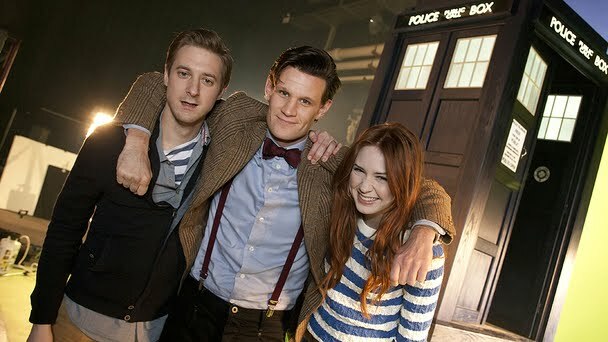 But it isn’t all upset for the Ponds, as the adventures continue in episode two with Dinosaurs On A Spaceship, written by Chris Chibnall. That was a crazy filming adventure, exclaims Karen, with all the adventures that I have been on through-out the show that was perhaps the most surreal! There was a lot of running from things we couldn’t see, which is always fun, BUT a couple of the cast got to ride a dinosaur. And Mark Williams comes along for the ride as Rory’s dad Brian Williams, He was so fantastic, naturally funny and such great casting, you could totally imagine Rory having a dad like that. This series has some great guest stars, characters and of course monsters, she teases. Featuring an alien with a score to settle A Town Called Mercy also reveals a different side to the Doctor as Amy claims, So this is what happens when you travel alone. In the series we see a slight shift in the Ponds’ relationship with the Doctor, Just as any relationship changes when it matures, explains Karen. We get to see a glimpse of what Amy and Rory do when the Doctor isn’t around and how the adventures and time away from home has affected their own relationships with friends and family. I think the Doctor also begins to realise how he has changed Amy and what happens when he isn’t there, and at first he doesn’t really understand it. There is a really sweet moment in episode 5 when the Doctor notices Amy is wearing glasses, she hints. The neverending pranks and my two best friends, Karen is talking about what she is going to miss as she takes her bow from the show, Matt used to hide in the cupboard of my trailer and jump out of me and I used to go flying back against the wall in absolute shook! He must have done it like a hundred times and I fell for it every single time! But honestly even with the bruises, it really was the biggest and most exciting time of my life. I wouldn’t change it for the world! I always knew that Steven had an ending for Amy Pond and when I met with him a year or so ago it was kind of like, so what are the plans for the character and we both said that she should go at this point. It was such a fantastic mutual decision and completely the right time for Amy to leave. I will miss her, but I can’t wait for fans to see what happens.